Are you looking for safe and convenient storage for your RV, car, boat, motorcycle or trailer? Harbor Bay RV & Storage offers a wide variety of affordable short and long-term storage solutions for all vehicle types. Inside units, which offer protection from the environment, sun, rain, rodent infestation, theft or vandalism, are ideal for car restoration projects, extended travel, corporate fleet storage, motorcycles and military personnel looking to safely store your vehicles. 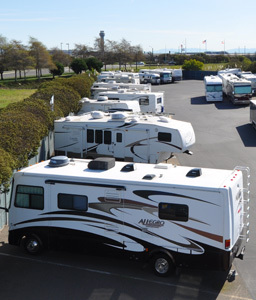 With plenty of room to move, turn & park – all behind our security gate – our 115 outdoor parking spaces on blacktop pavement provide ideal short and long term storage for your RV, boat, auto or trailer. Exterior parking spaces range from 10′ X 20′ to 10′ X 40′ with waste disposal and available non-potable water refill. As a long time tenant, I’m very happy with the facility and service! I love that there is a dump station on site which is very helpful after a long drive back from enjoying our RV.